Discussion in 'Latest US & World News' started by James Knapp, Nov 6, 2018. So, we have even more confirmation of the EU's desire to create an army to defend against Russia, China and surprisingly America. This was dismissed during the Brexit campaign as fallacy but those who know the European Union knew all along their goal is to create a giant country which destroys national borders, language and identity. It seems apparent that Macron is being primed to take over from Merkel once she finally realises that the majority of Europe and now Germans loathe her and her loony policies. The funny thing is, Macron has only been in power for a year and he is already showing signs of weakness. The real question is how does this effect Germany, if the EU were to create an army would this be in contravention to the laws still in place to restrict the German army? No foreign armies and/or nuclear weapons may be stationed in the area of the former GDR and Berlin. And in what world would the EU need to defend against America? DennisTate and Merwen like this. The EU will not get to this point. Any such move would result in the instant departure of Italy and Eastern Europe, which would then place pressure on France. Any Europe without Italy and the UK is a farce more than anything. People simply don't want a Federal Europe. They are overplaying their hand. Playing J8o like pocket Aces. Interesting, but what to do about NATO? Nothing new, the EU has planned an European army for quite a time but the UK vetoed all attempts to form it. After the Brexit decision the EU is able to go on and the EU announced their plannings in 2017 and funningly May announced that the UK wants to be part of it. The participating Member States are: Austria, Belgium, Bulgaria, Czech Republic, Croatia, Cyprus, Estonia, Finland, France, Germany, Greece, Hungary, Italy, Ireland, Latvia, Lithuania, Luxembourg, the Netherlands, Poland, Portugal, Romania, Slovenia, Slovakia, Spain and Sweden. There are already several multinational European brigades (French-German, Dutch-German, Romanian-German) and exchange programs for officers and now there will be a European military acadamy. EU countries armies are using a wide variety of weapon systems and the aim is to consolidate the army equipments and to coordinate new projects. The EU (without UK) has a military budget at about 200 billion € and over 1 million soldiers but the actual fighting power is far too low. There will be no effect regarding the German military and agreements made while the German reunification. PESCO isn't a project in opposition to NATO but an addition. This was dismissed during the Brexit campaign as fallacy but those who know the European Union knew all along their goal is to create a giant country which destroys national borders, language and identity. No, that was never the intent. Really? So what in your opinion is the end goal? Individual, free nations who make decisions for themselves?! There are over 30 international organizations of countries all over the world, plus a number of non-state international organizations (the Red Cross, for instance), but only the EU is at the receiving end of all kind of creepy conspiracy theories. Why? Simple, really. A democratic, united Europe is perceived as a threat by the leaders of Russia, a country lacking natural defenses on its borders and in dire need of warm water ports. The name of the game is divide et impera: the Russian bear supports far right ultra nationalistic political parties in Europe, hoping that once those parties gain enough power, they'll take their countries out of the EU, maybe out of NATO as well, letting Russia to rebuild its empire and then some. Individual free nations who make decisions for themselves are not threatened by the democratic processes in the EU. The threat comes from the north-east, actually. Does anyone think that the African Union is a threat for each of its 55 individual member states, all African nations who make decisions for themselves? Durandal and goody like this. But does the African Union dictate spending in each country? Do they tell each country how many immigrants they must take? Do they pass laws which all others must obey? Does the African Union have it's own currency? Europe has become far more fragmented in recent years due to the policies of the EU. I know people like to blame Russia for everything but it's the EU bureaucracy that has caused the friction. scarlet witch, Fred C Dobbs and MMC like this. "Emmanuel Macron has called for the creation of a “true European army” to allow the EU defend itself from threats ranging from Donald Trump to Vladimir Putin. President Macron, Lady Oscar would like a word with you. Take a look at the last time the Supreme and Paramount Leader of the Free World sat in the White House. It seems that President Macron would benefit from meeting with Condoleezza Rice. 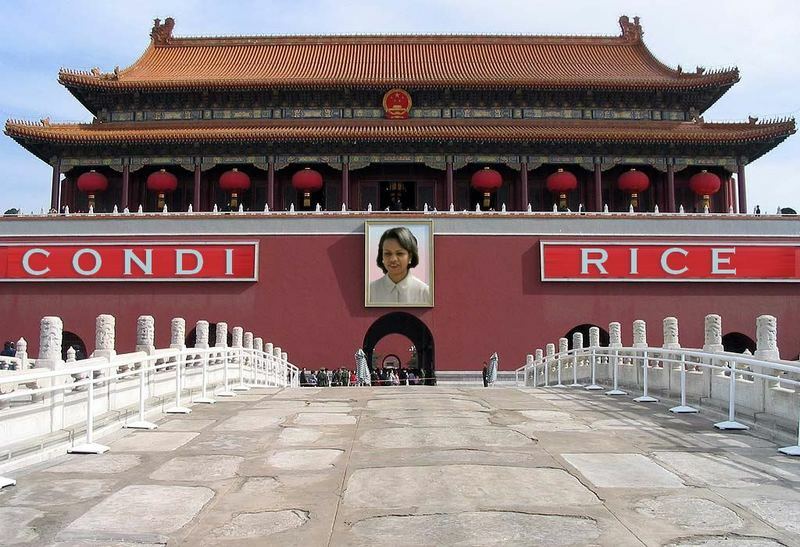 I don't speak for Condi but I am very confident that she would be delighted to meet with him. Spoiler: Has Macron given Condi the cold shoulder? Wait - has President Macron remembered to invite Condoleezza Rice to the Armistice centenary event in France, to hobnob with other world leaders? If not, that may be why Macron is feeling somewhat alienated and threatened by other world leaders. The others probably can't understand why Macron is not paying homage to Condi, if indeed he is not. "Glory, glory Condoleezza Rice & Ronald Reagan's truth is marching on!" Let's not forget Condi's critical role in the liberation of Eastern Europe, the reunification of German - a Europe whole and free. Condoleezza Rice is a world leader of such an exceptional ability and accomplishments that we may never see her like again for as long as any of us live. Therefore, President Macron, you and other European leaders should consult Condi and listen to her advice carefully before making any big changes to the security organisation of Europe. But does the African Union dictate spending in each country? The EU doesn't dictate spending but all members of the € zone agreed on certain rules and they have to follow them. Do they tell each country how many immigrants they must take? The EU doesn't dictate the numbers of immigrants. Do they pass laws which all others must obey? All laws are implemented by the national governments and prior the national governments and the EU parliament have to agree. A lot of the EU's problems are caused by national governments who fail to do their jobs and then blame the EU. RiaRaeb and Durandal like this. Is Jamie Redknapp a distant uncle or something ? Maybe the best post ever from you so far... interesting... what happened to you? Playing some chess lately? Does the African union have a well functioning umbrella role that shelters the "very same values" of each member by which every member is also governed regardless? How many members of the African union share similar cultural and religious values really? Not the best examplification to strengthen your already strong position @Pisa. You've almost screwed it up.. Look even I can barely helped you... please be more careful next time ok? No but Harry Redknapp did groom me when I was a child. So I do end up dreaming about him a lot and changed my name accordingly but I digress. Since when did all European countries share similar values? The UK is very different to Greece, Italy is different from Sweden, the list is endless. The goal is to eradicate the differences so we are one and the same. It isn't Europe anymore if that's the case. Since many years. All are Christian majority countries and have parliamentary secular democratic regimes. Greece is like orthodox Turkish majority as litwin had put 5 light years ago, I agree but still they comply with Brussels despite all their laziness and unqualified labor. So let's give them credit for that. Southern Italy has a lot of Greek immigrants that's why they look as bad but the northern Italy matters the most right? So we got Milan instead of Naples the den of thieves. Russia knows this and undermines the North by bribes. Corruption is a huge setback I know. EU must survive. Otherwise we're going to have to start another renaissance... no cool. Why we still have NATO when the mission was accomplished...Idk. No, the government of said country at the time signed their country up to an agreement which wasn't theirs to call. For example, I bet the Italians never voted or were asked if they wanted spending restrictions. Puppet Berlusconi signed them up for things they were consulted on, same as Blair and Brown did to us. Yes it does. See Hungary, Poland etc. I agree with what the EU started out to be, about trade but no one asked for what they are now; The Government, Bank and Law Makers of Europe. Fred C Dobbs and Thingamabob like this. Eliminate, or smooth over the rough parts so that peace and cooperation prevail? Same thing happened in the United States, really. The central (federal) government has grown by leaps and bounds. I think that kind of consolidation and centralization of power is practically inevitable over time, because it's the easiest path to getting things accomplished at a macro level. I’m not claiming to be right but if you think that Europe is in a state of peace and not approaching boiling point then you must have been living under a rock. I’m not saying their intentions aren’t well meant but it doesn’t work and will not work. I do agree that it is probably the inevitable outcome of the world in general to become more centralised but when it happens unnaturally and prematurely, you get the outcome we see today, nationalism. OK, but that's more actual result than intended result, and you were originally talking about intent. It doesn't help having Russia constantly working against the EU through subversive means, and of course the migrant/refugee crisis has been a big hit.